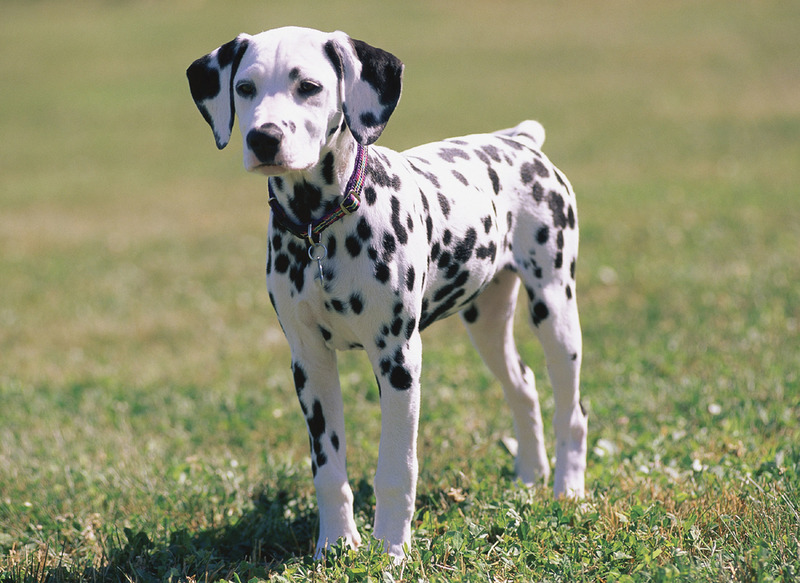 The Dalmatian is a large, distinctive dog that has white fur with black or liver-colored spots. This quiet, friendly, alert, and muscular dog requires plenty of exercise; it has remarkable endurance. Dalmatian puppies are pure white; they develop spots as they grow. The Dalmatian was originally bred in the 1400’s in Dalmatia (on the Adriatic coast of Eastern Europe in what is now Croatia). In the 1800’s the Dalmatian was used as a carriage dog; it trotted alongside horse-drawn carriages, especially fire trucks. Dalmatians are about 22 to 24 inches (56-61 cm) tall at the shoulders and weigh about 50 to 55 pounds (23-25 kg). The coat is short, sleek, and glossy. The tail is long and tapering.